Michelle Pusateri, the founder of Nana Joes Granola, has always found a place inside the kitchen. From an early age, she found comfort in cooking and being in the kitchen with her father. When she was 15, Pusateri started waiting tables and making cappuccinos at the local mall cafe. This experience sparked a front of the house career and a love affair with the fast-paced environment of food service. After 15 years bartending, Pusateri decided to take a few culinary classes at her local Texas community college and fell in love with the science of baking and the intricate measurements that brought bread and pastries to life. After attending the Culinary Institute of America for a Baking and Pastry certificate, Pusateri moved to San Francisco where she worked as a pastry cook at The Fairmont Hotel, the Four Seasons Hotel, and Nopa. 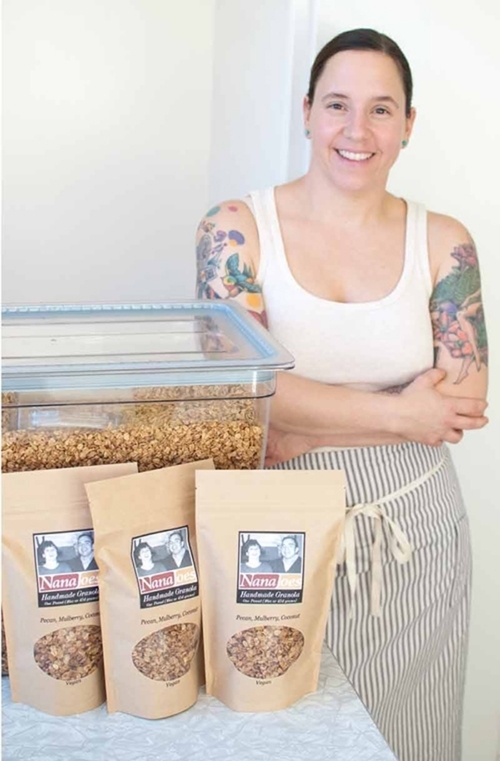 Pusateri was the pastry chef of Magnolia Brewery and Nopalito before starting Nana Joes Granola in 2010. For the last seven years, Pusateri has made an impact on her local community and she full heartedly believes in community before profit.